Series C First series of beer coasters realized by L-M CARPENTIER for the Brewery. 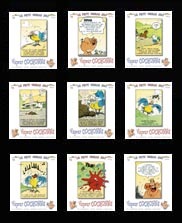 Nine coasters with various images of "Cochonne Songs" taken from the Comic strip "Songs Cochonne" EDITIONS TOPGAME. This series is completely sold out. Series Y Nine coasters with various images of "Cochonne Songs" taken from the Comic strip "Drinking songs "ÉDITIONS TOPGAME"
Signs of the zodiac Series of 15 coasters for the Vapeur en Folie.